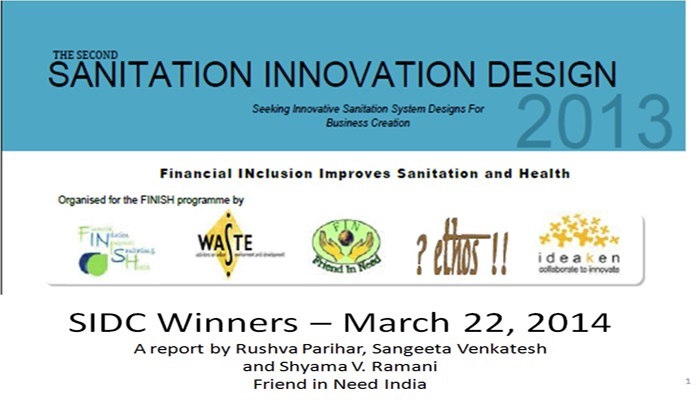 In order to Seek Innovative sanitation system designs for business creation FINISH Society in association with WASTE-Netherlands, Ideaken and ethos organized second FINISH sanitation challenge contest in March 2013. A total reward amount of INR7, 00,000 / EURO10,000 was offered by WASTE. The contest was based on the premise that among other factors, the lack of sanitation coverage in rural India (and elsewhere), is due to lack of innovation on possible 'designs' to fit diverse environmental and social economic conditions, water needs and local availability of materials. Therefore, in order to promote innovation generation in this much neglected field, FINISH organized an innovation contest, where the innovation can take the form of a novel design for: 1. urinals 2. individual toilets 3. community toilets 4. multi-purpose toilets The objective of the contest was to create useful knowledge that will promote entrepreneurship and small business creation in sanitation activities.